Cameron Neylon (Curtin University) Michael Carroll (American University), and Ernesto Priego (City University London) recently joined OASPA for a webinar to discuss attribution in open access publishing — an important, timely issue for publishers that goes hand-in-hand with licensing. Catriona MacCallum (PLOS) chaired the discussion. The Copyright Clearance Center hosted the webinar. Leyla Williams, Events and Communications Coordinator at OASPA, reflects on the discussion. We’re all aware of attribution in open access publishing – it’s the ‘BY’ in the Creative Commons licenses, now a widely accepted industry standard for scholarly research. But focus often centres on what the user can do with the license, rather than the ‘attribution’ of the original source. Attribution is a straightforward legal requirement, but copyright and licensing practices vary amongst publishers, and attributing is often assumed to be the same as citation. As we see the increasing use of computation in scholarly research, standardising attribution practices now will pay dividends in the future. Catriona MacCallum opened the discussion by noting that Creative Commons licenses have become the standard means by which credit can be given to authors in open access publishing. Any potential membership applicant to OASPA, Catriona continued, must have at least one journal which features ‘CC-BY’, or in some cases ‘CC BY-NC’ content, which allows those accessing research to remix, tweak, and build upon work, while acknowledging the original author in the process. But there are ongoing challenges in the attribution realm: unclear licensing frameworks, differing community norms of content reuse, and varying disciplinary attitudes to attribution. Catriona handed over to Cameron Neylon, who presented on the topic, with Michael Carroll and Ernesto Priego as respondents. Cameron began by underlining the importance of attribution. Those working on and interested in open access share a common belief in the maximum amount of people being able to ‘take content and research outputs, and make them available in a form that others can use in ways that we haven’t yet thought about.’ Licensing, Cameron argued, is at the centre of open access publishing work: having a common set of licenses expresses a set of values around content reuse, but also enables legal consistency around reuse. Importantly, he continued, the use of such licenses lay the foundation for interoperability – information to flow between communities, not just within them. Core to licensing, Cameron noted, is attribution. 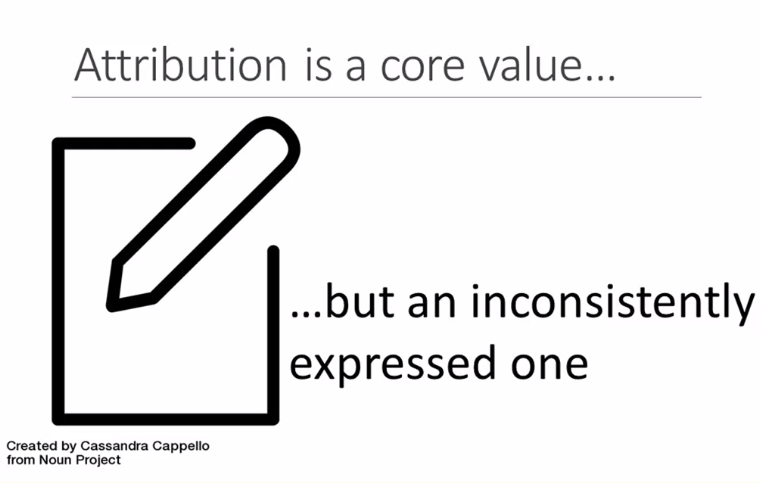 But unlike the consistency seen in licensing behaviours and values, attribution is often inconsistently expressed. Attribution, he cautioned, is not citation: citation is a bibliographic practice particular to research to enable someone else to find the work you are describing, whereas attribution is a ‘legal requirement under Creative Commons licenses to recognize the copyright holder’. To ‘attribute’ does not simply mean to cite the work of the author you are reusing, since authors are not always the copyright holders. Cameron pointed out that by thinking through case studies and day-to-day attribution practices, the OASPA principles go some way to tackle the particular challenges of third-party marketers failing to properly attribute academic content, and of the difficulty humanities scholars have found in having translated work attributed correctly. Many translation-related challenges, for example, can be overcome by making attribution very explicit. Beyond the establishment of attribution principles, Cameron wondered if the creation of stock examples of how to attribute would be helpful to distribute, if further education was needed around standard forms of attribution, and if so, what form guidance should take – and who should take responsibility for enforcing any rules. Cameron then moved onto explore the attribution-licensing relationship. 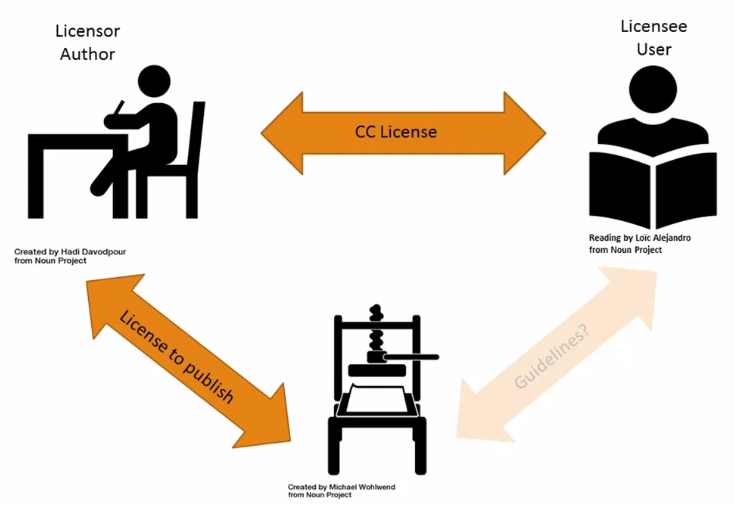 Depicted in his diagram below, Cameron explained that Creative Commons licenses bind together the author and the user of the content through attribution, while a separate ‘license to publish’ creates the relationship between the author and the publisher. 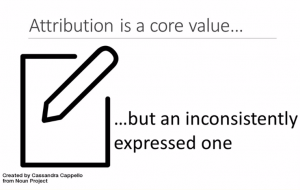 Attribution requirements by the publisher then establish the relationship between the publisher and content users – which may differ between publishers. There may be real opportunities, argued Cameron, for publishers to standardise their publisher-user attribution guidelines. In response, Ernesto Priego remarked that within the humanities realm, difficulties lie in third-party content being reused with Creative Commons licenses when the original author did not intend it to be. To navigate this challenge, publishers such as the Open Library of Humanities have CC-BY as their licensing default, but offer other licensing options, and the journal Ernesto edits, Comics Grid, has a special clause for third-party content re-users. He cautioned that standardisation, especially around third-party content, is still needed however. Following on from this, Michael Carroll wondered if attribution is often described in too complex a fashion. Users need to be aware of the copyright status of the content they are working with, and the source of their right to use it. Creative Commons licenses provide people with the means to attribute, but without being too specific about how authors satisfy the legal conditions of licenses. This, he argues, enables flexibility in the way materials are presented. But the addition of the statement of attribution principles, he continued, is important: it encourages the open access publishing community to come together and think about how to make ‘attribution and citation synonymous’. Standardisation of attribution practices, rather than competition, Michael noted, would be most beneficial to the community. Ernesto agreed with this analysis, adding that CC-BY licensing has generally been well taken-up by the humanities community. In response, Cameron commented that he hoped that the establishment of standardised attribution practices would build a ‘stronger knowledge network’. In the Q&A session, Cameron was asked if the ORCID ID would ever be used as a standard citation. Certainly there are ways of this being taken up in the future, Cameron replied. Catriona followed this up with a question on data held in repositories or the paper itself: how was attribution for data different to that for publications? Cameron answered that often, there is very little copyright associated with data – and that as a result, it is often better placed into the public domain. Publishers are well placed to lead the way in standardising attribution practices and OASPA looks forward to further discussions on developing attribution standards – and how these could be implemented across different disciplines. The recording of this webinar, along with the accompanying slides, can be found on the OASPA website here. A full list of all our webinar recordings to date can be found here.